The Science Of 'Interstellar' : 13.7: Cosmos And Culture Few, if any, movies have been this faithful to science and still managed to tell a gripping tale, says commentator Marcelo Gleiser — though some liberties are taken at points. 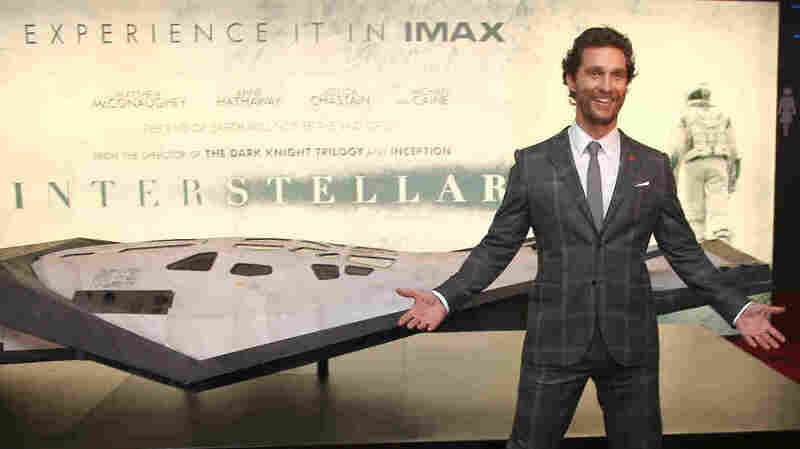 Actor Matthew McConaughey poses with a model spacecraft at the premiere of the film Interstellar in October. Every child must leave home one day — but rarely because he has destroyed his home. This is the central predicament of Christopher Nolan's new epic movie, Interstellar. In the not too distant future, Earth is progressively headed toward becoming uninhabitable. A large fraction of the world's population has perished or has been killed or both — it's not quite clear. Food is scarce, as almost nothing grows in the parched climate. Dust is everywhere; those who are still around are slowly suffocating. The only hope for mankind is to find another home, some other planet going around a different star, as similar to our own as possible. Unfortunately, another Earth is not a very easy thing to find. Earth-like planets are the main focus of our ongoing planetary hunt. Is Earth rare and unique, or commonplace? The only way to find out is to look, searching for other planets with similar properties: mass, liquid water on the surface, carbon compounds, fairly dense atmosphere. Judging from the nearly 2,000 planets found so far, things are not looking good. Sure, other "Earths" may be out there, but they are not ubiquitous. In Interstellar, the search takes our species to another galaxy that's really far away — many millions of light years away. That's a major problem. Vast distances separate individual stars — let alone entire galaxies — making interstellar travel an impossibility, at least with current technology. Just to reach our closest neighbor, the Alpha Centauri star system a mere 4.4 light years away, would take more than 100,000 years. (One of the science slips in the movie occurs when Matthew McConaughey, the best pilot NASA had when it operated, claims it would take 1,000 years to reach nearby stars.) Way too long to help those on Earth. At best, we could dream up a scenario where thousands of Earthlings would embark in a spaceship version of Noah's Ark and spend eons traveling in outer space in search of a new promised planet. Thousands of generations would live and die inside the ark, losing any connection with their original planetary home. Unless, of course, we could travel through wormholes in space. When I was at the University of California, Santa Barbara, as a young postdoctoral fellow at the Institute for Theoretical Physics, the U.S. National Academy of Sciences teamed up with the Soviet Academy of Sciences to select 10 young cosmologists for an exchange program. The first year we would travel to the Soviet Union and spend three weeks there with our peers; the second, they would come to us. One of the masterminds of the project was Caltech physicist Kip Thorne, a world-renowned expert in general relativity, Einstein's theory of gravity. Kip was our chaperone, and we had a wonderful time learning from him and getting to know him. He was, even then, telling us all about wormholes and time travel, pushing Einstein's ideas to the limit. Kip's enthusiasm for science is contagious, especially if the science involves curved spaces — so the fact that he is the scientific mind behind Interstellar is a real blessing. He recently published a book with a foreword by Christopher Nolan, The Science of Interstellar. As of Thursday, the book was ranked in the top 100 on Amazon.com's Best Seller list. The computing power used to generate the simulations of large wormholes and black holes in the film was so vast that new science came out of it, an unprecedented collaboration between Hollywood and academia. I was moved not only by the story — it's impossible not to be — but by the effort to present some of the key concepts in ways people can understand them. Notably, the demonstration and explanation of a wormhole using a bent piece of paper and a pencil. Wormholes are shortcuts through curved space. You can imagine a little bug going around a bottle to get to the opposite side or, if it could, going right through it. That's the key idea. If wormholes exist, if they have wide mouths, and if they can be kept open — three big but not impossible "ifs" — then it's conceivable that we could travel through them to far-away spots in the universe. Arthur C. Clarke used them in 2001: A Space Odyssey, where the alien intelligences had constructed a network of intersecting tunnels they used as we use the subway. Carl Sagan used them in Contact, so that humans could confirm the existence of intelligent extraterrestrials. Interstellar uses them so that we can get try to find another home for our species. Judging from the prospects shown in the movie, the Nolan brothers don't think we have a very good chance. The ending goes a bit wacko, as Cooper, played by Matthew McConaughey, falls into a black hole, contacts his daughter in the past, and manages to get out with a little help from the mysterious intelligences that had constructed the wormhole (and, apparently, the giant library where this key scene takes place). To me, it recalled Jorge Luis Borges's remarkable Library of Babel, a repository of all possible books, where time didn't quite exist and rooms with bookshelves repeated each other periodically through endless space. This is all very speculative, of course, and filmgoers may recall mention of extra dimensions and of beings with the ability to move across more than our usual three. (Were they us in the future?) Somehow, it appears, they mastered control of the laws of nature in ways we can't even anticipate, being able to shape the flow of time and the power of gravity as if they were sculptures. At this point, claims of the movie being based on verified science must be jettisoned quickly. Speculative science perhaps, hanging by a thin thread into the abyss of wild stuff beneath. But so much fun. Still, the main point of the movie is not the science — it's loss. Loss of a parent, who goes off into space with little chance of returning, loss of a mother to a brain tumor, loss of a planet because of human greed and stupidity, loss of whole chunks of time to the subtleties of general relativity and loneliness — overwhelming loneliness. At one meaningful moment Ann Hathaway, who plays a biologist, speaks of love as a physical force. She does so in a somewhat obscure scientific way, which sounds a bit awkward, even if it's well-delivered. But love is a force — if not physical, certainly metaphorically. And it is this power that needs to be invoked as we, today, face all the potential losses that Interstellar brings to the screen with such devastating impact. Let it not be an elegy to our planet, but the siren awakening us to a more viable relationship with our home among the stars. Clearly, at least for the foreseeable future, we are here to stay.